Continuing on my mission to attend to the releases I should have reviewed in 2018, I now turn to the fantastic second full-length from San Luis Obispo, California's Hayley and the Crushers. Cool/Lame was released on Eccentric Pop Records in September, and I can't think of any other situation in the world where ten bucks will buy you this much fun! There are a lot of ways that reviewers have described Hayley and the Crushers, but the band's own "poolside glitter trash" is probably the most apt summation. Taking musical inspiration from surf, sunny '60s pop, oldies rock n' roll, and of course the almighty Ramones, Hayley and the Crushers sound like the band you wish were playing your next beach party. They inhabit a spirit not just of pure fun, but also of embracing weirdness and individuality. And who can't get behind that?! This band may never be able to shake the Go-Go's comparisons - especially not if they keep writing amazing songs like "Small Lives"! Elsewhere this album delivers a delightful mix of bubblegum punk, cool surf rock, and straight-up fun rock n' roll. But while the music draws obvious inspiration from the legacy of beach culture, Hayley's lyrics steer clear of cliche and bring a smart, modern perspective. How many other party bands out there are writing songs about the dark secrets lurking under the perfect sheen of suburbia or romance blooming against a backdrop of apocalypse?! 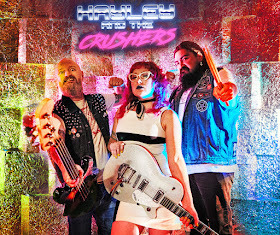 Are Hayley and the Crushers the ultimate California surf-punk band? I'd say they're more like the Bizarro World version - which is way cooler in my book!